By	Allyson Haymaker. Last edited by Marios Alexandrou on February 19, 2019. Even if you know nothing about Frank Lloyd Wright, you'll enjoy touring Taliesin, his fascinating home that's often been described as his autobiography in wood and stone. 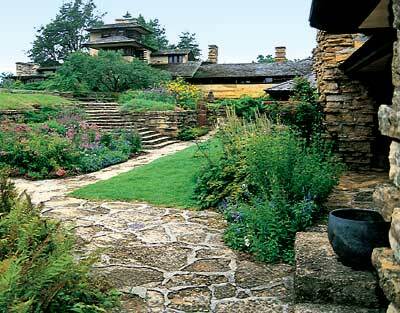 For nearly 50 years, Wright lived and worked in Taliesin, overlooking the picturesque southwest-Wisconsin valley where his ancestors settled. The sprawling 37,000-square-foot, 50-room masterpiece includes many of Wright's trademarks, particularly the harmonious fusion of building and landscape. The 2-hour tour I took with my husband recently was both interesting and surprising. 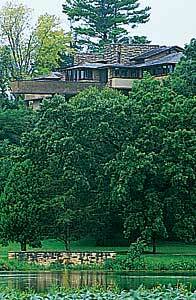 For instance, we learned that Taliesin is a Welsh word for “shining brow”, reflecting Wright's firm belief that buildings should sit on the brow of a hill, never right on top of it. We also were bemused that this internationally known architect made use of even the most mundane items — witness the arbors he cleverly fashioned from cow stanchions. And did you know that Wright loved plywood? We'd assumed Taliesin would gleam with fine hardwoods, but he liked plywood because it was versatile and inexpensive. We also found out that because Taliesin doubled as a home and hands-on architectural school for a community of apprentices, it was a constantly evolving work in progress. That offered another good reason to use plywood! Our guide was excellent. She offered an enthusiastic and reverent narrative filled with insightful Wright anecdotes. One of our favorites was how Wright, who possessed a staggering collection of Oriental artwork and furnishings, cut an extremely rare Oriental rug down to size when it didn't fit in the room for which it was bought! He then hung up, turned to his panicked assistants and said, “Gentlemen, sharpen your pencils.” And about 3 hours later, Wright greeted the wealthy Pittsburgh businessman with not only floor plans, but an eloquent description of the house's every facet. The Pennsylvania home, called Fallingwater because it straddles a waterfall, became one of Wright's most famous designs — and it followed the plans to a “T”. After viewing this visionary's simple genius firsthand, you'll be just as impressed as his assistants were.